How can trade-fairs and exhibitions like Chemspec India help an entrepreneur of chemicals?? Trade shows like CHEMSPEC INDIA provide you opportunities for chemical manufacturers and traders to do a lot of things that they normally will not be able to do effectively and efficiently during your day-to-day business operations. First, they allow chemicals manufacturers and traders to demonstrate their products and services to a more targeted audience as Chemspec India have specific themes and subjects. It is a lot easier to find good quality leads , inquiries and even sources of supply and turn them into actual customers or affiliates. Second, they allow you to discover the depth of the market. In trade shows like CHEMSPEC, not only will you be exhibiting, so will your competitors. It provides a great opportunity for your to find out what they have been doing and figure out their business strategies and analyze their products and services like how they are doing business and new ideas of promotions. Third, they provide publicity for you and visibility to your industry partners. Just the fact that you are present in Chemspec will tell your industry partners that you have been operating profitably and it will provide them confidence to continue to work with you. Fourth, just the fact that you will have to talk and interact with a lot of people from the same or similar chemical and fine chemical industries will help you gather market intelligence to figure out what direction you need to take in terms of product / service development as well as management. In the end, participating in CHEMSPEC INDIA will help you with product/service demonstration, evaluation of market landscape, provision of publicity and visibility and collection of market intelligence. Because of these benefits, you should definitely participate in CHEMSPEC INDIA . 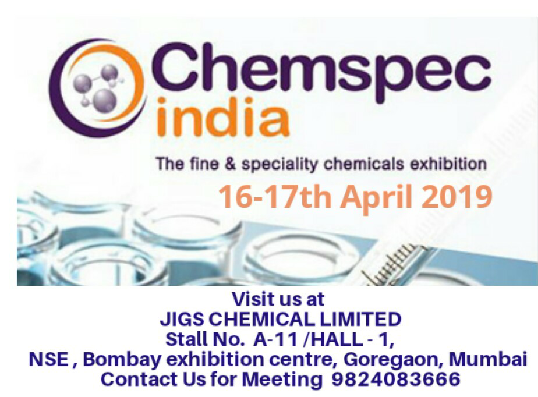 we JIGS CHEMICAL LTD. is the regular participent of CHEMSPEC INDIA from last 12 years.